Justice Department divisions that have been mirroring their files in real time can still do so under the new Justice Consolidated Office Network II. 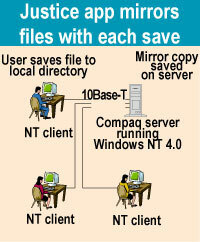 Every time a user saves a file, PeerSync software makes a simultaneous backup that can be used when a hard drive fails. For years, some Justice users have had a system that simultaneously saved file changes to desktop PCs and servers. Under JCON II, employees in the Civil, Tax and Civil Rights divisions and the 95 U.S. attorneys' offices will use the file synchronization functions of PeerSync 4.3 from Peer Software Inc. of Hauppauge, N.Y.
As a background process on systems running Microsoft Windows NT, PeerSync makes a simultaneous backup on a server every time a user saves the file to a directory on a client computer. In the Civil Division, file mirroring 'is a cultural thing'something the users have definitely come to expect,' said Kevin Burket, the division's JCON project manager. The JCON office automation system delivers word processing, file and print services, and e-mail to much of Justice. JCON II is now being deployed to supplant the original JCON, which has been plagued by technical glitches [GCN, June 22, 1998, Page 12, and May 8, Page 13]. The JCON II architecture specifies Compaq Computer Corp. and Dell Computer Corp. clients connected to Compaq ProLiant 3000, 6500 and 7000 servers, all running NT 4.0. The Civil Division is 'a little over a third of the way done' converting its Windows 95 clients to NT and connecting them to JCON II, Burket said. Some machines needed hard drive upgrades and extra RAM to run NT. Before the Civil Division converted to JCON in 1997, it used an office automation system called Amicus, Burket said. Amicus resided on Data General Corp. machines running the proprietary AOS/VS operating system. A customized Amicus application first gave the Civil Division synchronized file mirroring, Burket said. But JCON integrators ran into trouble when they tried to make the function work between Win95 clients and Unix servers. The initial mirroring package caused delays in copying files, said Tom Poore, senior technical staff member at DynCorp of Reston, Va. When users shut down their computers, a final mirroring process would hang. The application also appended a letter and a tilde symbol to the beginning of each backup filename on the server, but not on the client, Poore said. Justice officials wanted to get rid of the peculiarity. The JCON team turned to PeerSync about two years ago, after what Poore called an exhaustive search for a commercial product that met all the department's requirements. Even PeerSync didn't meet the specifications at first, so the integrators talked with Peer Software officials, who added the real-time mirroring and several other features to the commercial software, Poore said. PeerSync initially minimized itself on the Windows client taskbar, Poore said. At Justice's request, the application was changed to an unobtrusive icon in the tray at the lower right-hand corner of the screen. PeerSync is a client-side application that runs on users' PCs, not on the central server, Poore said. Besides the simultaneous file mirroring, some Justice groups use PeerSync for pushing application patches and upgrades to users at initial log-in. 'This is handled seamlessly to the users. They don't even know that it occurred, other than that they've got new functionality in the application,' Poore said. As the PeerSync software mirrors files, it records the actions in a log file in the same directory in which PeerSync itself is installed, Poore said. Technical staff can troubleshoot the client computers remotely with the logs. Not all Justice agencies using JCON II employ the synchronized file mirroring. About 630 Civil Division employees are now on JCON II, while another 1,100 users are still on the original network, Burket said. The division's JCON II rollout probably won't be finished until this fall at field offices in New York and San Francisco, he said. Peer Software recently announced a new version of its PeerSync software, called PeerSync Pro II Version 5.0. But the Civil Division is 'not in a position to shift gears right now in the middle of a rollout,' Burket said. Once the division is fully converted to JCON II, the technical staff can start testing new software releases, he said. 'The requirements and the requests that were made by Justice have certainly driven the evolution of the product,' Peer Software spokesman Charles Epstein said.